PA head finally speaks after repeated terror attacks, playing down escalation - even though his Fatah faction initially claimed a shooting. 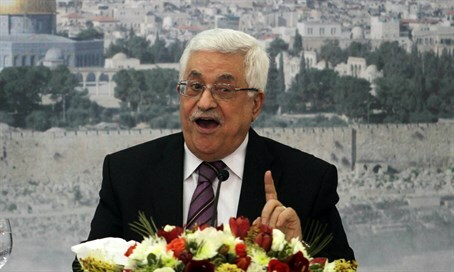 Palestinian Authority (PA) Chairman Mahmoud Abbas said Tuesday he wanted to avoid an escalation of violence with Israel following several brutal murders conducted by Arab terrorists. "We don't want a military and security escalation with Israel," he said at a meeting of Palestinian officials, according to the PA's official news agency Wafa. The mention of "political movements" is significant given that Abbas's Fatah faction claimed responsibility for the murder of a young couple last Thursday, before the Israel Security Agency (ISA) nabbed the Hamas terror cell that conducted the attack. The Martyr Abdul-Qader al-Husseini Brigades "armed wing" of Abbas's Fatah claimed responsibility for the murder and went on to post photos of its members passing out candy to celebrate the attack. While Hamas - which Abbas signed a unity agreement with last April - may have conducted the attack, the PA is actively paying jailed Hamas terror leaders, showing the close symbiosis between the rival factions when it comes to terrorism. Fatah terrorists also took a role in last summer's terror war by launching rockets at Israeli civilians from Gaza, and Abbas just last month called for violence to block Jewish "filth" from visiting the Temple Mount in Jerusalem, as he praised "martyrs" spilling blood in the Holy City.